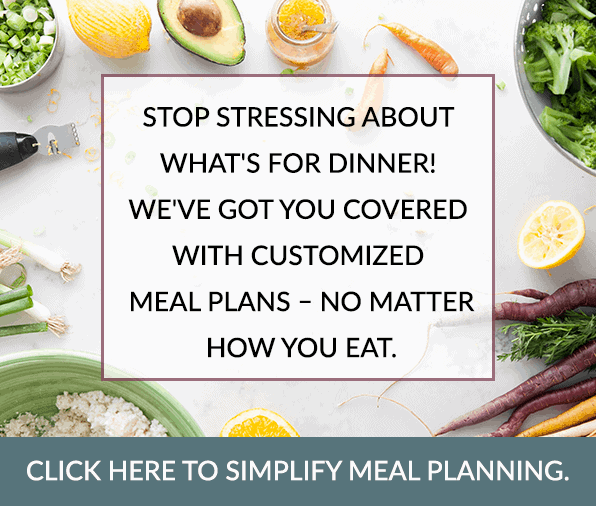 Make-ahead meals are the key to happiness (and sanity)! 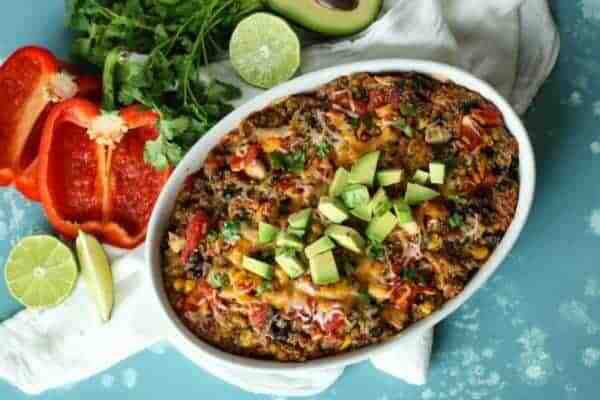 This Southwest Quinoa Bake takes the pressure off on busy weeknights. At the risk of sounding like a broken record, meal prepping is where it’s at. Especially if you lead a busy life – and who doesn’t these days?! 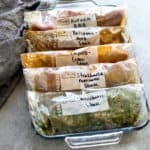 I could even go so far as to say that “Meal prepping saves lives.” Hangry is not a good state to be in, whether it’s you, your spouse or partner or your kids. 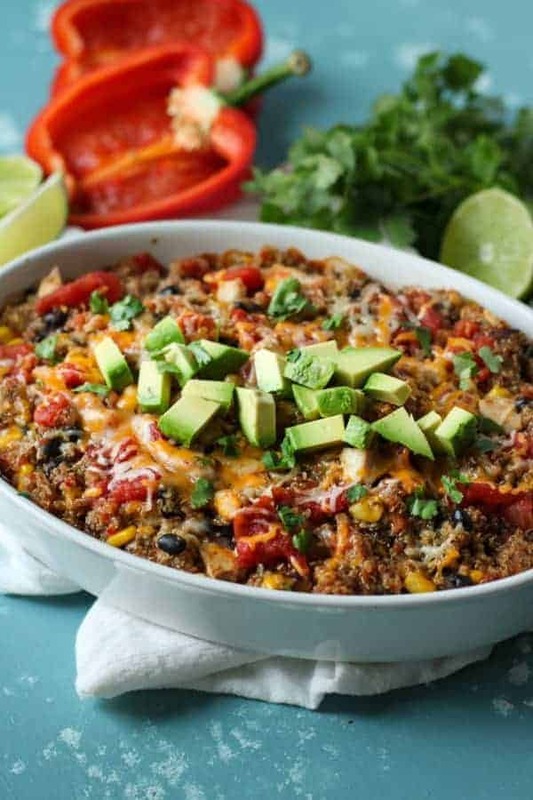 Hangry people are scary people who need something wholesome and nourishing ASAP – like this Southwest Quinoa Bake that you can make ahead on the weekend and stash in the fridge until you’re ready to pop it in the oven. Or you can just bake it on prep day and enjoy reheat & eat convenience later in the week depending on how you anticipate your week will shake out. I know that my weeks are always busy and that they’re a lot like a giant snowball rolling downhill, picking up speed as the week goes on. That’s why I always try to prep one make-ahead meal each week. 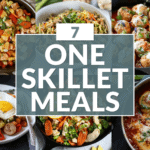 It may not be as convenient as cold cereal or a trip through the drive-thru but it’s whole lot more satisfying and healthy so I’ll take that over super-convenient any day. I don’t really like quinoa. I mean, I do, but not when it’s all by itself as a side dish. 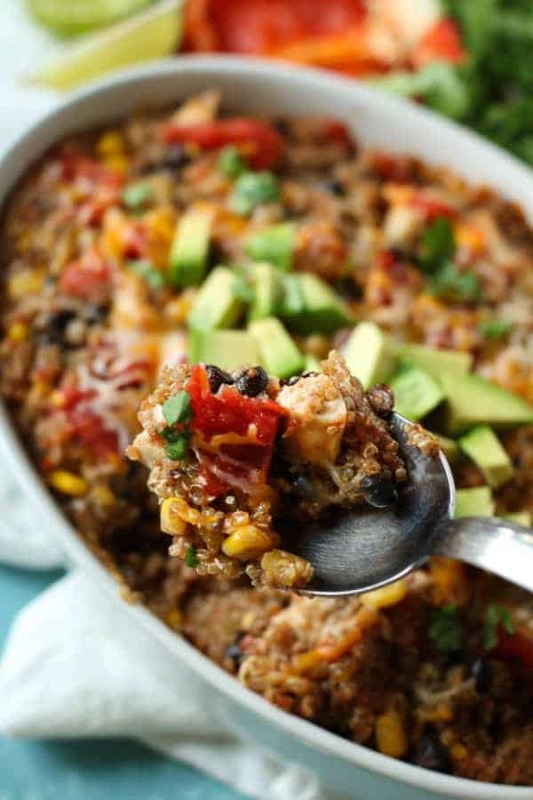 To me, plain quinoa is not tasty but when you combine it with your favorite salsa, canned black beans, a little frozen corn, chicken and cheese like this Southwest Quinoa Bake well, then it’s delicious. It’s kind of like fajitas or chicken tacos all wrapped up in one hearty, comforting dish and when you put it that way…I guess I really do like quinoa (Hahaha! Now I sound like my kids!) 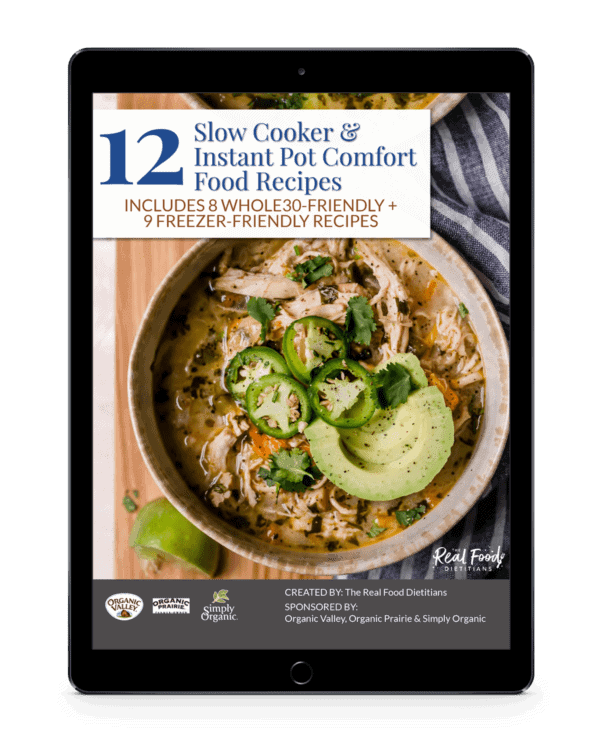 But in all seriousness though, this dish is delish and it’s easy to make especially if you use a rotisserie chicken or leftover cooked chicken from another meal (or our Instant Pot Whole Chicken recipe). 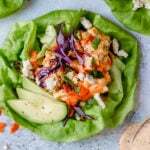 It been appearing more and more often on our weekly meal plan and even the kids like it as long as I stick with a mild salsa and serve theirs with a dollop of sour cream. 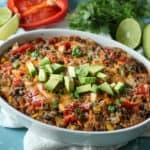 If you’re feeling the squeeze that comes with a packed work/family/social calendar or just life in general then try adding this Southwest Quinoa Bake to your next meal prep so you have a little something healthy and hearty tucked away for ‘one of those nights’. You’ll be glad you did. 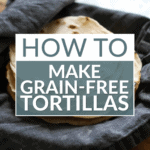 To make vegan: Substitute an additional 1 – 1 ½ cups black beans (or pinto beans) for chicken and omit cheese (or use your favorite non-dairy cheese alternative). 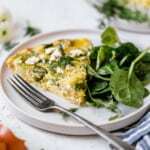 This dish may be made ahead through Step 5 then stored in the fridge for up to 3 days before baking in a preheated 350℉ oven for 40-45 minutes. * Note – If using Tiny Hero Quinoa, cooking directions differ slightly from regular quinoa so you’ll want to cook it according to the package directions instead of those in Step 2 below. Preheat oven to 350℉. 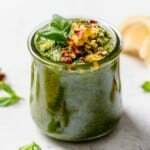 Grease a small casserole dish or 9×9-inch glass baking dish with coconut oil and set aside. Place quinoa in a fine-mesh strainer and rinse under cool running water for 30-60 seconds. Transfer to a medium saucepan and add 2 cups water or broth. Bring to a coil then cover pan and reduce heat to medium-low. Allow quinoa to cook, covered, for 15 minutes or liquid is absorbed. Let stand covered for 5 minutes then fluff with fork. While quinoa is cooking, place a large skillet over medium-high heat and add 2 tsp. coconut oil. When oil starts to shimmer, add cubed chicken. Cook 5-6 minutes then stir with a spatula. Continue cooking another 3-4 minutes or until chicken is no longer pink inside. In a large bowl, combine drained quinoa and chicken with remaining ingredients reserving ¼ cup shredded cheese for later use. Stir well to combine. What’s your go-to busy weeknight meal? Are you more inclined to prepare make-ahead meals or just wing it when life gets messy? 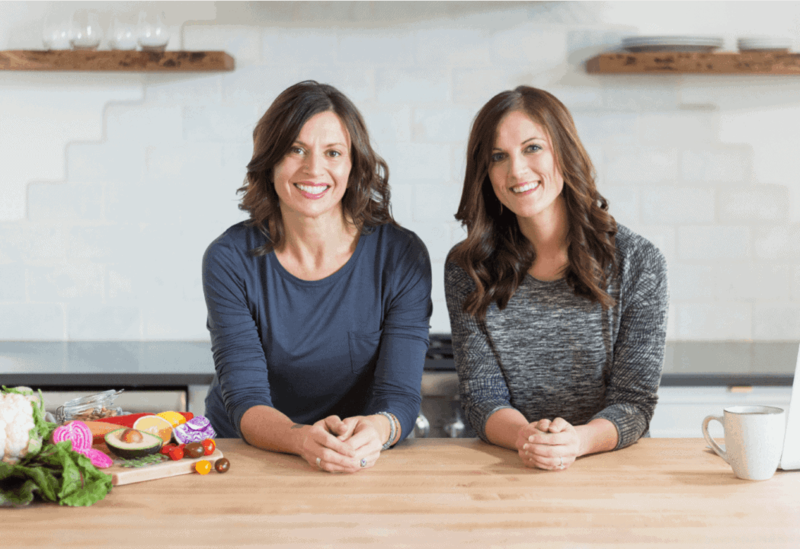 What, if anything, is holding you back from meal prepping? Share in the comments below! Excellent recipe for a cold winters night! I substituted cooked ground beef because I had some in the freezer and it turned out great, definitely a keeper. Will make it with chicken next time. Thanks for the inspiration, it’s nice to have new ideas to keep the cooking boredom at bay. I love how you used what you had on hand to make this dish and I’m so glad you loved it. I made the recipe but incorporated baking the quinoa so it was 1 dish. Put frozen onions, tricolor peppers and peas along with spices into quinoa then added hot chicken broth. Ssasoned chicken on top, sealed with foil. Next time I will use less broth because frozen Veggies added liquid but both kids liked it. Uncovered, smothered in salsa, sprinkled cheese and baked more. Yum! What a great idea – thanks so much for sharing!